While hard to fathom today, the Hawaiian Islands were once home to many railroads. Except for the Hawaii Consolidated Railway (located on the Big Island of Hawaii) all were built to the "narrow-gauge" width of three feet, constructed primarily to serve the numerous sugar and pineapple plantations found there. They reached their zenith during the late 19th century and survived until the World War II era. Surprisingly, you can still catch a train on Hawaii with three different excursions available at the Hawaiian Railway, Kauai Plantation Railway, and Lahaina, Kaanapali & Pacific Railroad (better known as the Sugar Cane Train). All feature very short rides although provide visitors a chance to experience Hawaii's little known history with the iron horse. The information provided here only briefly highlights all of the state's railroad attractions; for more information about each please visit the accompanying map, provided by Google. The introduction of railroads in Hawaii was largely due to U.S. intervention. On September 9, 1876 the Kingdom of Hawaii and the United States signed an agreement allowing the latter to harvest sugar, at no cost to Hawaii, for the right to establish a coaling station at Pearl River Lagoon, present-day location of Pearl Harbor Naval Station (Hawaii would become an American territory in 1898 and achieve state-hood on August 21, 1959). To extract and refine sugar required an extensive array of equipment and materials, which soon arrived in large quantities. Transportation, of course, was vital in moving the raw and processed product efficiently and profitably. Since there were no established roads, and reliable, motorized travel was still decades away, railroads were tapped for the job. According to George Hilton’s book, “American Narrow Gauge Railroads,” such systems were chosen on Hawaii for a number of reasons: firstly, to provide fluid (compatible) interchange among private (common-carrier) and plantation-owned operations; secondly, there was no standard-gauge precedent as in the continental United States (4 feet, 8 1/2 inches’); and thirdly, they were less costly to construct. Altogether, Hawaii's notable narrow-gauge railroads (3 foot, unless otherwise noted) included the Ahukini Terminal & Railroad Company (2-foot, 6-inch), Hawaii Railway, Kahului Railroad, Kauai Railway (2-foot, 6-inch), Koolau Railway, Oahu Railway & Land Company, and the Hawaiian Agricultural Company's private 2 foot system on the Big Island which linked its mill at Pahala with the port at Punaluu. The Big Island's history is best known for the Hawaii Consolidated Railway, the state's only standard-gauge operation. It began as the Hilo Railroad chartered on March 28th, 1899, to connect the Olaa sugar mill with Waiakea, running a distance of 8 miles. As the years passed the railroad made numerous extensions, which included lines to Olaa, Kapoho (17 miles), Hilo itself and later a 12.5-mile line north of Olaa to Glenwood (the latter was scaled back in the early 1930's). The railroad continued to grow during the 20th century with a 33.5-mile line up the Hamakua coast. This extension was extremely expensive with numerous tunnels and bridges. The project would ultimately force the railroad into receivership during 1914. It emerged as the Hawaii Consolidated Railway and providing a vital transportation service for the island through World War II (its Hamarkua Division was a popular tourist attraction). As was the case with the Oahu Railway & Land Company, however, the massive and devastating tsunami on April 1st, 1946 destroyed numerous bridges and washed out the right-of-way in several locations. The blow from Mother Nature immediately forced suspension of operations as the company did not have the millions needed to rebuild its infrastructure. Today, the Hawaiian Railway Society has reconstructed over 6 miles of its network with plans for further extensions. The Hawaiian Railway Society, based in Ewa on the island of Oahu, operates short 90-minute train rides on a former stretch of the Oahu Railway & Land Company (OR&L). During the journey you will hear about the history of this railroad and the sugar cane operations that were once prolific in the area. According to Dr. Hilton's book, the OR&L was chartered by Benjamin Franklin Dillingham on September 11, 1888, a franchise signed into law by King Kalakaua. Its purpose was to serve sugar plantations, opening its first segment between Aiea and Honolulu on September 16, 1889 (9 miles). In the succeeding years it headed west, followed the coast, and reached Kaena Point on June 1, 1898. The railroad eventually wrapped its way around the island and terminated at Kahuku on December 28, 1898, interchanging there with the Koolau Railway. In 1906 it completed one notable a branch, an 11-mile spur from Waipahu Junction at Pearl Harbor to Wahiawa which served a pineapple plantation. This line was later extended to a connection with the main line near Waialua during World War II for defensive measures. 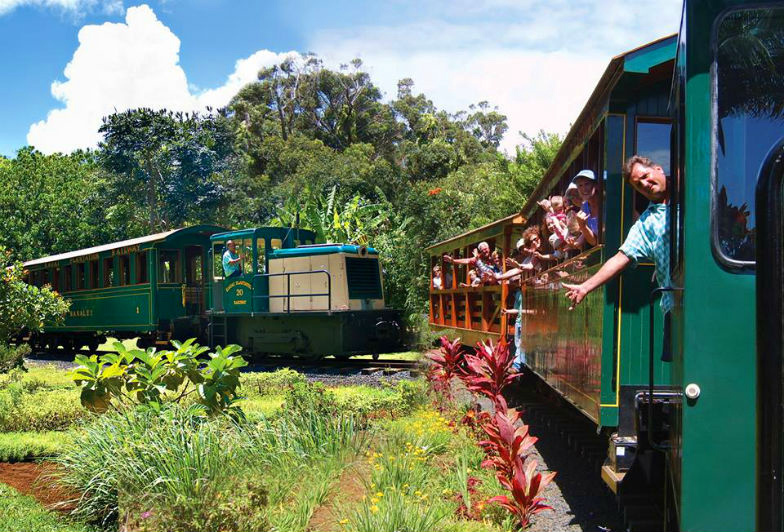 The Kauai Plantation Railway is based in Lihue on the island of Kauai. A relatively new tourist train it operates a 2.5-mile section of former Kauai Railway. This small system was established in 1906 by the Theodore H. Davies & Company to serve sugar mills situated along the island's southern shore. It would eventually open an 11-mile route running eastward from Eleele Landing (Port Allen) to the Koloa Mill with another short branch (2 miles) serving the town of Koloa. In addition, it utilized trackage to the west owned by the McBryde Sugar Company and Hawaiian Sugar Company to serve the Makaweli Sugar Mill. The railroad was built to the odd width of 2-feet, 6-inches but did carry common-carrier status (although few passengers ever rode its trains). It was a short-lived affair and was abandoned in 1933. Today's tourist attraction operates with a Whitcomb diesel locomotive but plans to restore steam locomotives that were original to the narrow-gauge. The Lahaina, Kaanapali & Pacific Railroad, better known as the Sugar Cane Train, is helping keep alive, bring back, and revitalize Hawaii's rich railroading history. 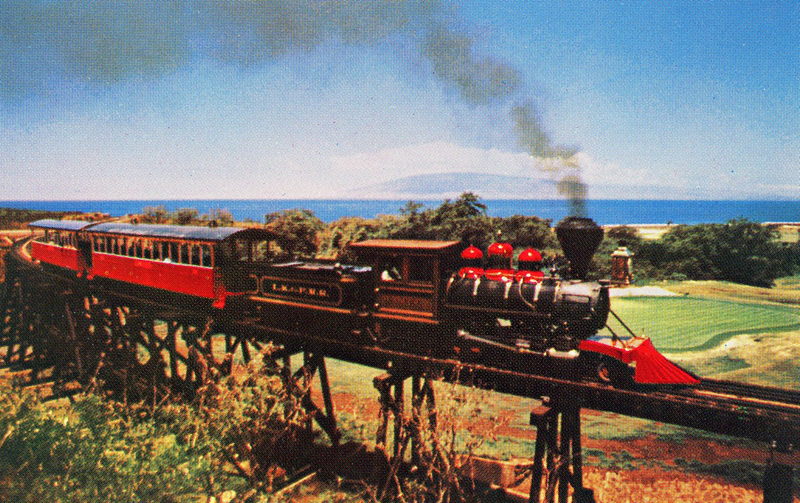 The little tourist line, located on the Island of Maui, has been in operation since 1969 when the Sugar Cane Train was launched under the direction A.W. "Mac" McKelvy. Today's LK&P continues to operate the 6 miles of trackage connecting Lahaina to Puukolii with which it began those many years ago. While it is certainly no Strasburg Railroad (situated in Pennsylvania's Lancaster County) or Napa Valley Wine Train (located in California's Bay Area) it is nevertheless a unique and interesting operation based within a tropical setting which can be found no where else in the United States. 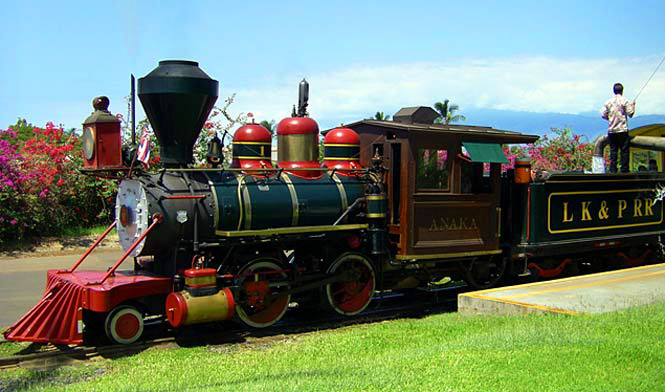 During your trip you will learn about Hawaii's fascinating history with trains. It was announced during the summer of 2014 the Sugar Cane Train would likely close but this unthinkable scenario was averted when local businessmen stepped in to keep the operation alive. If interested in riding this attraction please click here. Hawaii's only railroad museum, which provides no excursions of any type, is the Laupahoehoe Train Museum, located in Laupahoehoe on the north shore of Hawaii (the Big Island). This little organization's mission is to generally preserve the local history of North Hilo and Hamakua while also maintaining Hawaii's railroad heritage, once quite rich and diverse! The museum is open on select days of the week, year-round (except major holidays), or by appointment. There are a few pieces of rolling stock on the grounds; most noteworthy include a wooden caboose that originally operated on the Hawaiian Consolidated Railway and a small diesel switcher which originally came from a local plantation in Haina. This little unit was manufactured by the Plymouth Locomotive Works and was in very poor condition when located. It has since been restored to operable condition. Although there is no place to run the locomotive it is housed beneath a shed, protected from the elements. The Pineapple Express, located in Wahiawa on the island of Oahu, provides train rides at the Dole Plantation. This attraction offers a wide range of things to do from tours of the property to train rides on their Pineapple Express. The excursion uses open-air cars powered by a three narrow-gauge "steam locomotives" (3-foot), although all three are actually diesel-powered. They include a 0-4-4T modeled after a design manufactured by the Mason Machine Works in Taunton, Massachusetts during 1883 (named "Lady Liberty"); a 4-4-0 designed after an 1870 model; and a little 0-6-0. The two-mile trip lasts about 20 minutes and provides narration of the plantation and its history. There are two different rides available named the Pineapple Express, and Aloha Express. The plantation is open nearly year-round and there is an admission required to ride the train. To learn more please visit their website by clicking here.